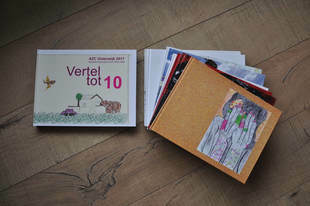 The project Vertel tot 10 is organized by a NGO for children and their parents in the asylum center. The ideas was that the parents would make a book for their children. During 10 meetings the parents learned about different techniques, making stories and learning about each other. Because many of the attendees didn't speak english or dutch I got the help from Mostafa Betaree, He took care of the stories and translations and I took care of drawing process and design. Some of the people had a natural talent for drawing but others I had to support more. It's a grateful project with as result a great serie of books. You could see the refugees relaxing and growing during the process. Many said that the 2 x 2 hours a week was a small escape from reality.